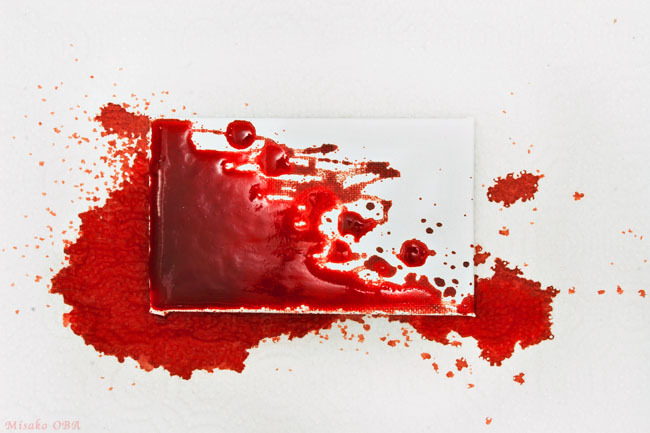 In folklore, an individual may make a pact with the devil, usually signed with their own blood. The pact involves loss of a part of the individual, the soul. But in Misako Oba’s case, it was the possibility of losing something else, and Goethe’s Faust became a metaphor for her experience in the 21st century. Oba’s photography explores the battle between an angel and a devil in her heart, as she deals with the emotional turmoil of a medical mystery. The photographs recount her reactions from despair, confusion and fear, accompanied by blood and tears, to defiance, a positive spirit and redefined beauty. This series is a visual statement of a true physical, emotional and spiritual journey that anyone might be called upon to make. This is about my FAUSTUS series (photographic series 2006-2011, 2014. Photo-based mixed media contains). *The photography book/artbook [FAUSTUS] was published in November 2014 in Japan. The title FAUSTUS was inspired by Goethe’s Faust. 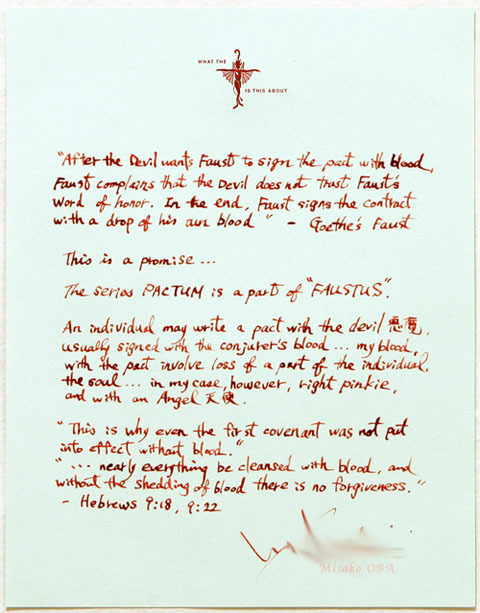 Faust, the main character, exchanges his soul with the devil by signing a pact with a drop of his blood. The cost of my pact was my finger. There were the battles of an angel and devil in my heart, but finally leading to a contract with the angel. * Faustus means “auspicious” or “blessed” in Latin. Misako OBA, “Pactum#20-III,” from the series FAUSTUS. When I heard about the movie FAUST (2011 Russian film directed by Alexander Sokurov. The dialogue is in German), I became curious to see it. It is the director’s free interpretation of German legend Faust and the adaptation of Goethe’s Faust. As long as I know, there is no theater playing it in the U.S as of today. I had a chance to see it in Tokyo at Cine Switch Theater. (-showing from June 2, 2012). Other theater in Japan will start showing from today (June 30, 2012) and/or coming soon. This entry was posted in Book, movie, Photography, Post in Japanese, review and tagged Alexander Sokurov, angel, blood, book, Devil, Faust, FAUSTUS, German, Goethe, Japan, legend, Mephisto, Misako OBA, movie, pact, Pactum, photography, Tokyo. Bookmark the permalink.